How did a land and people of such immense diversity come together under a banner of freedom and equality to form one of the most remarkable nations in the world? Everyone from young adults to grandparents will be fascinated by the answers uncovered in James West Davidson's vividly told A Little History of the United States. In 300 fast-moving pages, Davidson guides his readers through 500 years, from the first contact between the two halves of the world to the rise of America as a superpower in an era of atomic perils and diminishing resources. Between 1880 and 1930, Southern mobs hanged, burned, and otherwise tortured to death at least 3,300 African Americans. And yet the rest of the nation largely ignored the horror of lynching or took it for granted—until a young schoolteacher from Tennessee raised her voice. Her name was Ida B. Wells. In 'They Say,' historian James West Davidson recounts the first thirty years of this passionate woman's life—as well as the story of the great struggle over the meaning of race in post-emancipation America. In July 1903 Leonidas Hubbard, Jr., set out to traverse, by canoe and portage, one of the last blank spots on the map of North America—550 miles of the subarctic barrens of Labrador in northern Canada. Accompanied by his friend Dillon Wallace and a half-Cree woodsman named George Elson, he hoped to make a reputation as an adventurer and explorer. But deep in an unforgiving country empty of game and swept by polar winds, the little party was forced to turn back, ragged and starving, in a race for their lives. The tragic outcome of that journey sparked not one, but two rival expeditions that returned to Labrador in 1905. "History is what happened in the past." That is the everyday view of the matter and it is profoundly misleading. In seventeen case studies, ranging from the strange suicide of an American diplomat and the Salem witch trials, to the rise of slavery and the audio tapes of Watergate, historians James West Davidson and Mark Hamilton Lytle illustrate the detective work that historians use to reconstruct the past. As they demonstrate, the past is not history, only the raw materials of it. And how those raw materials are shaped is the subject explored in this classic work. 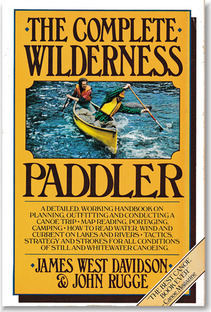 A detailed, working handbook on planning, outfitting, and conducting a canoe trip. Its pages cover map reading, portaging and camping techniques; how to read water, wind, and current on lakes and rivers; tactics, strategy and strokes for all conditions of still and whitewater canoeing. It illustrates these subjects by following one expedition undertaken in 1972 by James West Davidson and John Rugge. Along with two friends, the authors crossed Labrador to the headwaters of Quebec's Moisie River and then descended its long and wild river canyon. Puritans in both England and New England exhibited an intense interest in biblical prophecies about Christ's second coming and the millennium of peace and prosperity that was predicted to accompany it. How did such obscure speculations affect the outlook of those who engaged in them? Did they act as a spur to reform and revolution? Or did a concern with the end of the world lead to pessimism and withdrawal? James West Davidson's study of eighteenth-century New England suggests that one consistent effect of millennial thought was to encourage social polarization.